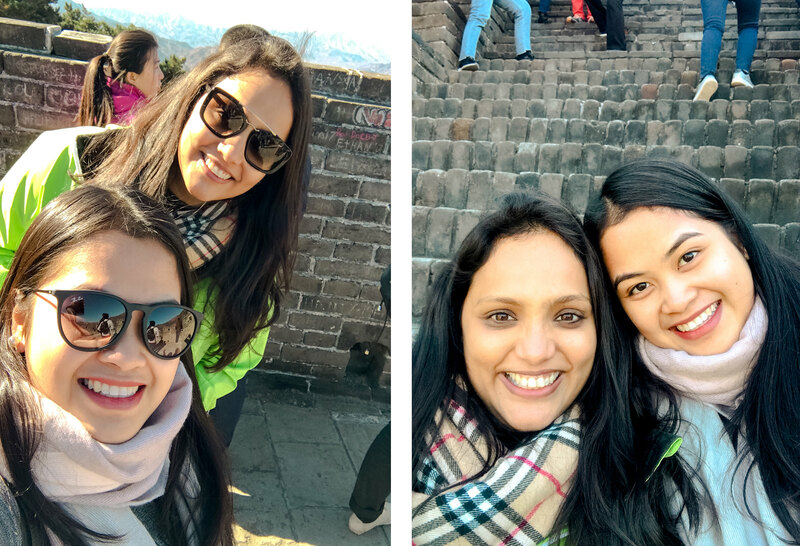 Our second day in Beijing was dedicated to visiting the Great Wall of China. Of course, a trip to Beijing wouldn’t be complete without visiting it. Our tour guide even jokingly mentioned that one cannot claim to have been to China if he/she has not been to the Great Wall. As we are all aware, the Great Wall of China is the longest structure in the world. It stretches across 15 provinces of China (!!!). With this, you have a lot of options on which section to visit. 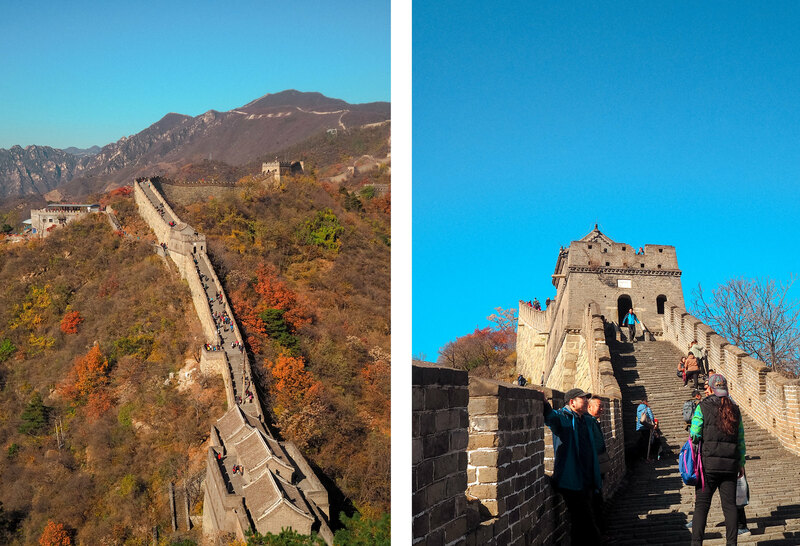 The most famous sections are Badaling, Mutianyu, and Juyongguan; these sections are the most accessible from the city, and they are the most-preserved. But this also means that these sections can get very crowded especially during peak seasons. Other sections like Simatai, Jinshaling, and Shuiguan are also well-preserved, but visited by lesser tourists because they are farther from the city. If you are a type of person looking for an adventure, then there are sections like Jiankou, Huanghuacheng, and Gubeikou, which have not been restored at all, so mostly the structures are dilapidated. We were torn between Mutianyu and Jinshaling sections. After weighing the pros and cons of both sections, my friend and I finally chose the Mutianyu section. 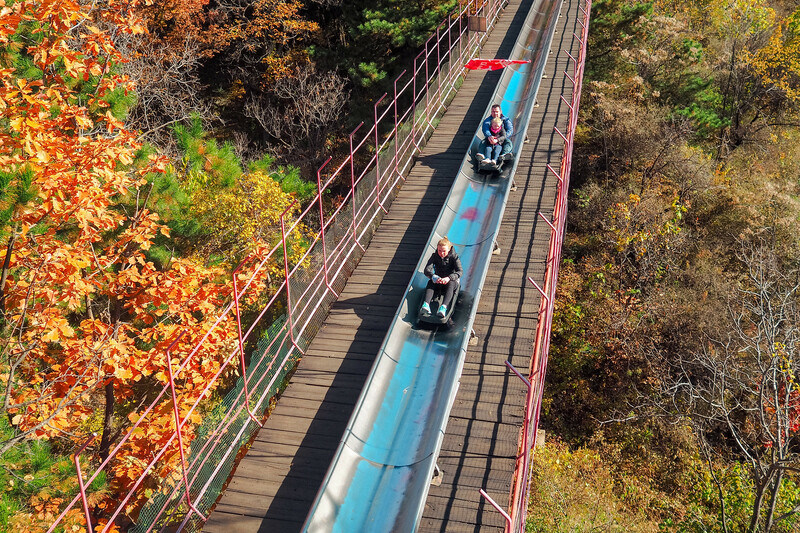 What gave Mutianyu the advantage is because it has both the cable car and toboggan rides, meaning — we can go up to the wall by cable card, and descent via the toboggan! 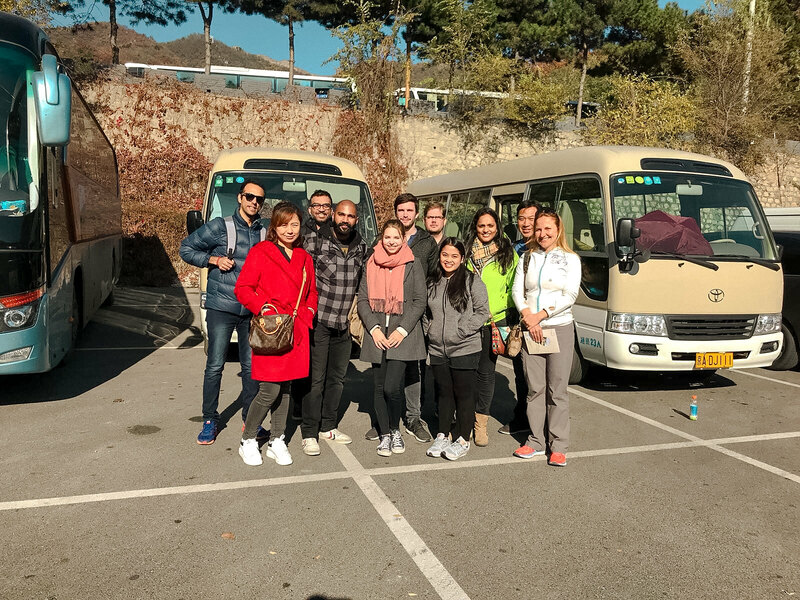 We booked a full-day tour from Viator which includes transportation, entrance fees, lunch, and an English-speaking guide. It was SG$90 per person (around 3.5k PhP). Anyway, our guide picked us up at our hotel at 8am. Our group is small one, composed of just 10 people hailing from different countries like Germany, India, Pakistan, Canada, and the US. The travel from Beijing to Mutianyu took two hours more or less. The traffic was not that bad that day, thankfully. 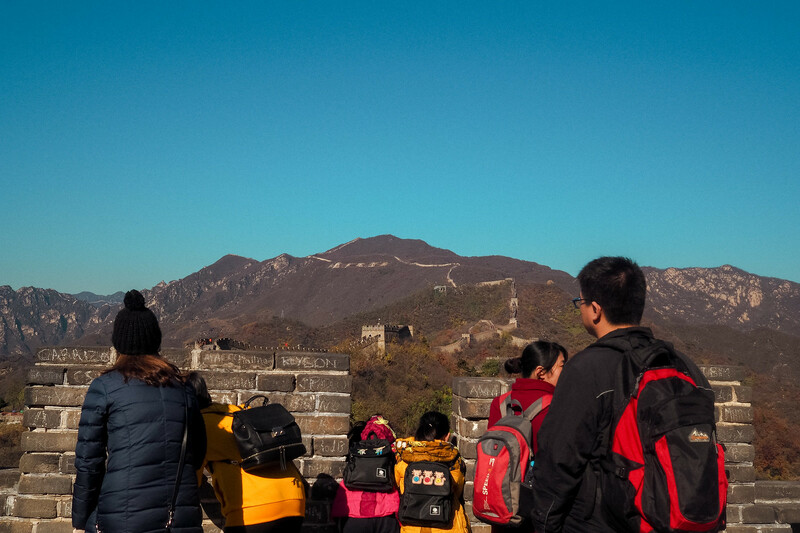 During the trip, our tour guide, Wendy, told us a lot of things about the Great Wall’s history, it was interesting at first, but I think everyone got bored eventually as she was literally blabbering. Her English was decent, though. Our first stop was at this jade museum and factory. The Chinese love their jade. They say diamonds and golds are the most precious minerals to most people, but for the Chinese, it is jade. The trip to the jade factory is a short one. I bought a jade pendant, which I think is a fake one. Lol. Or maybe it’s not 100% jade, because jade is damn expensive. I got the pendant for just a couple of dollars. We reached Mutianyu Great Wall less than an hour from the jade factory. When we got off from our coach, it was freezing! I checked the temperature and it was 5 degrees! Anyway, they parked our coach quite far from the wall entrance, so we needed to hike a bit to reach it. 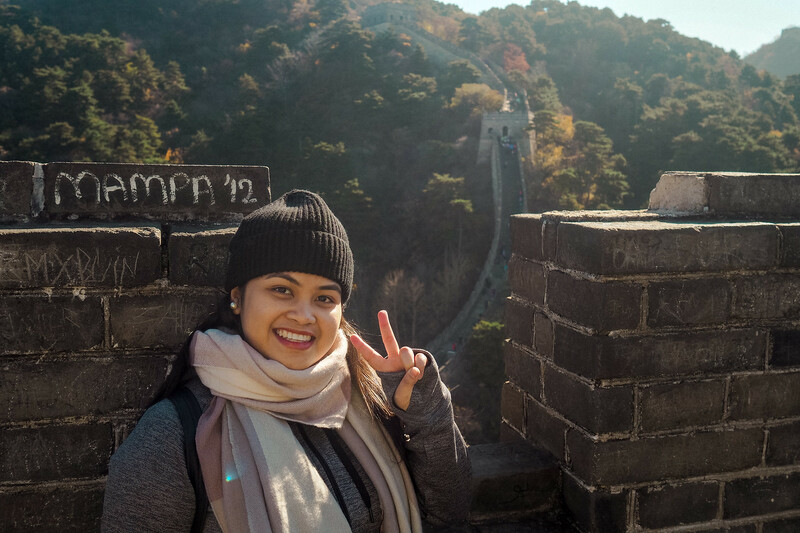 Before entering the great wall, Wendy gave us some tips on which part of the wall is best to visit. She also told us to ride the cable car going up, and toboggan going down as there’s no point of wasting our energy when there are a lot more of walls and stairs to waste energy for on the actual wall. Obviously, we already know this one as this was the reason why we opted for Mutianyu, but her point still stands. After the short talk with Wendy, we proceeded to ride the cable car. 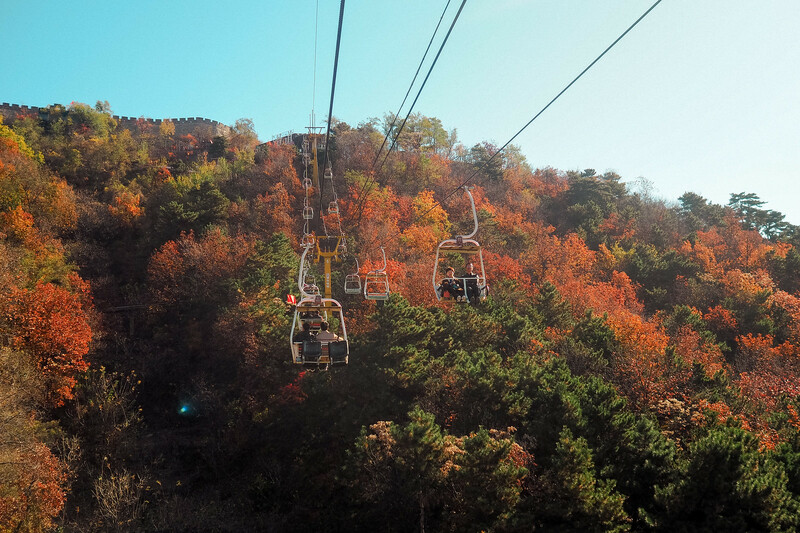 I was so surprised that it was an open cable car, the one similar in ski resorts. It was such a scary ride! The guy assisting us practically threw us to the seats, and off we go! I’m not usually scared of heights, but it was different that time. I felt unsafe in my seat, to be honest. A lot of bad scenarios were running around my head LOL. After the ride, all my fears disappeared when I saw the view of the wall. It was majestic. It was beautiful. The colourful red, yellow, and green hues from the trees on both sides of the wall made the view even prettier. Again, we were so fortunate that the area was not that crowded. I saw photos on the internet on how crowded the wall can be, like this. I bet the trip of those people sucked. We only climbed only one section of the wall as we didn’t want to be ambitious, the views are more or less the same anyway. 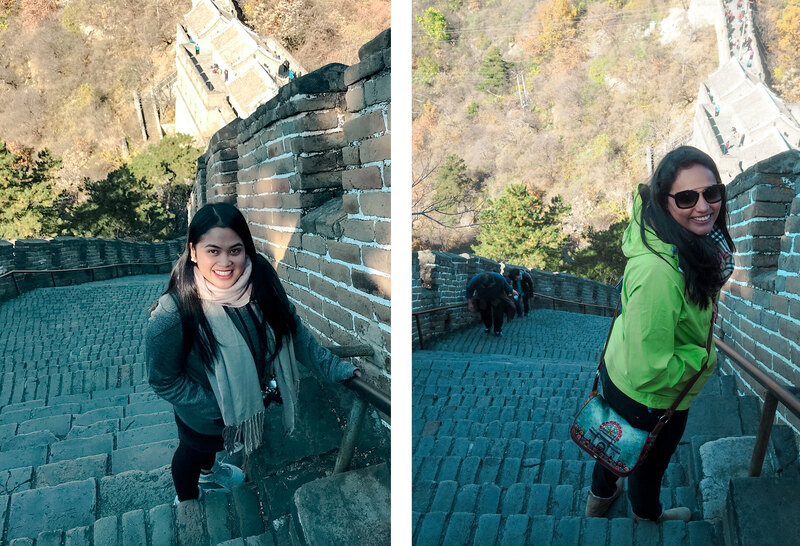 The steps were very little, and the wall is so steep. It was very exhausting. Going down was scary, I was reminded by the steps I climbed up and down on the temples in Cambodia. I think it was around half-past 11 when we started our descent, and met with our group to have our lunch. As planned, we went down riding the toboggan. It was a good 5-minute descent. It was really fun! We ate our lunch at a restaurant just outside the entrance of the wall. I was not able to take photos, though. We were all busy telling our stories, and getting to know each other. It was a good thing that the people in our group were nice and friendly. After we ate, we went back to our coach which took us to our last stop — a tea house in Beijing. I also failed to take photos here (lol), but basically, they taught us how to properly drink tea, and also the different types of tea. It was interesting. It was already 8pm when we reached Beijing. Most of the people from our group were dropped off to their hotel. Rajni and I, on the other hand, decided to join the two guys from Pakistan for dinner as we overheard them planning to eat the famous peking duck. 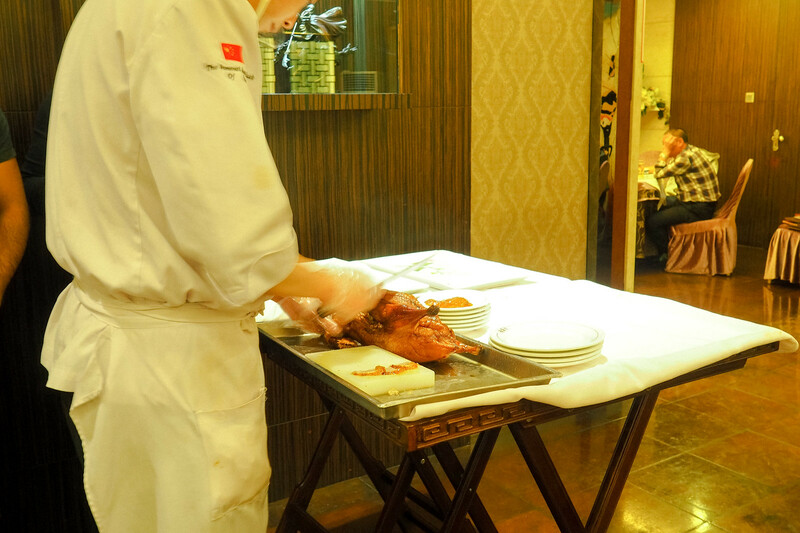 Eating peking duck was already included in our itinerary, but considering Rajni, who is a vegetarian, I was already prepared to let it go. 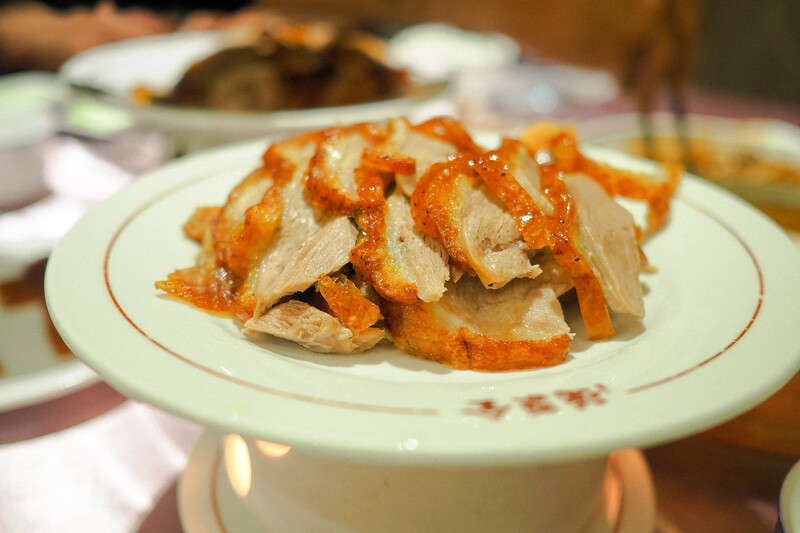 Hawker centres in Singapore, anyway, has abundance of roast duck dishes. But I still wanted to try it, of course! Good thing we were eavesdropping when they were discussing. It was actually Rajni who urged me to approach them as she is aware that I really like to try it. She’s cool. 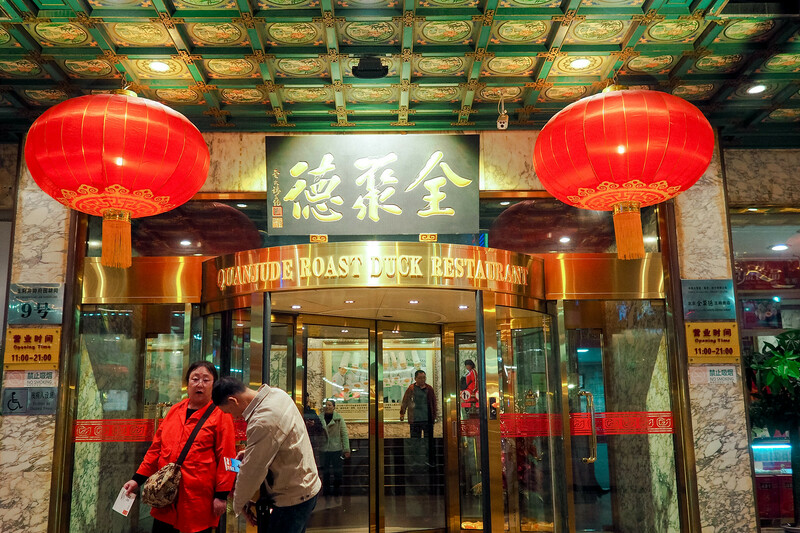 We went to Quanjude Roast Duck Restaurant in Wangfujing Street. 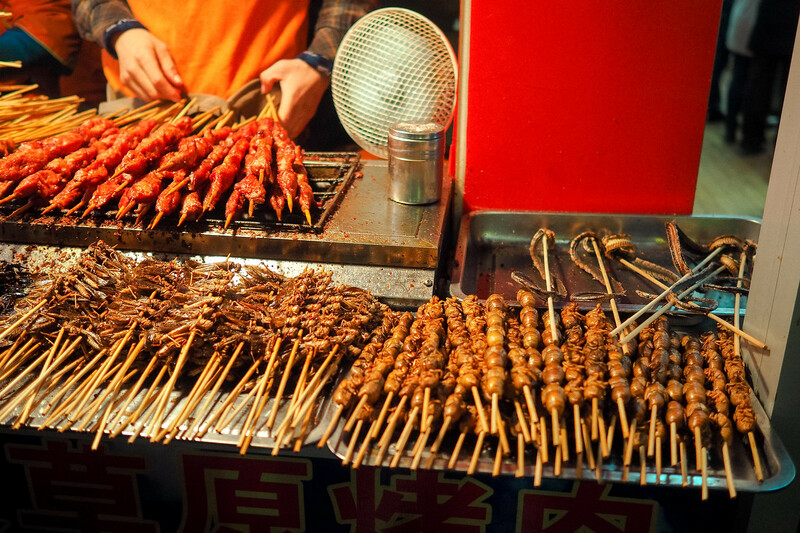 But before entering the restaurant, we roamed around the extremely busy food night market. A lot of exotic food were sold here! Before losing our appetites entirely at the sight of all the icky skewers, we decided to carry on with our dinner plans. We again experienced a lucky situation here: when we arrived, the queue was so long, and I think the waiting time was more than an hour. We got our queue number, but we were already called after waiting for only 15 minutes. We were so surprised because there were lot of people. But I think it is because it was just four of us. I noticed that the people in the queue were families and big groups, so maybe it was harder to accommodate them. Only three of us will be eating the duck, so we ordered a half duck. It was so delicious! We paired it with steamed rice, and some sort of pancake. Aside from the duck, we also ordered a vegetarian dish for Rajni. It was such satisfying dinner! The tenderness of the meat, and the texture of the skin was much better than the ones I have tried before. I was so happy I didn’t miss it! After dinner, we parted ways and bid our goodbyes to the boys. Their flight was early in the morning the next day so they needed to go back to their hotel. 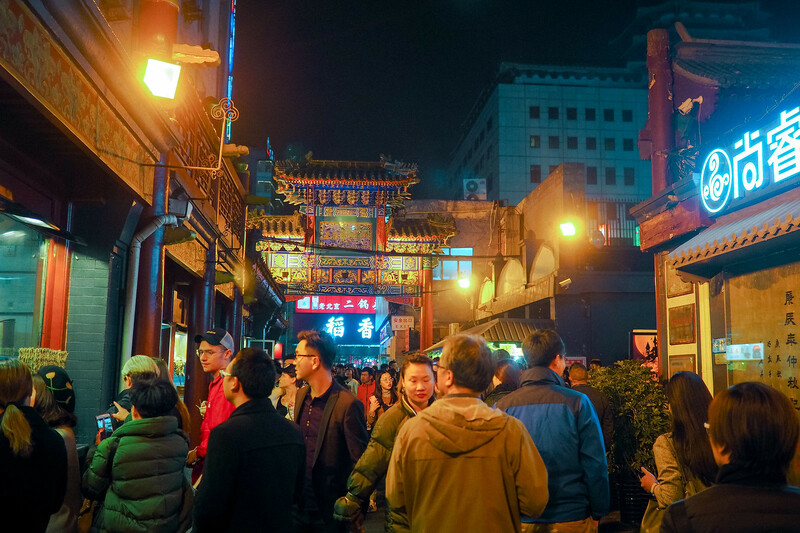 As for us, we roamed around for just a bit in Wangfujing Street before going back to our hotel to cap off our day.